Note 2: Ghotit = Got It! Solution for People with Dyslexia or Dysgraphia. A solution for people with dyslexia or dysgraphia needs to focus on their specific requirements. The goal of such a solution is to improve the work efficiency and overall quality of life for dyslexics. This document will describe the steps required to install and setup the Ghotit Real Writer & Reader 7N on a Windows laptop, desktop, tablet or hybrid. Local disk space: 1.5 GB. Note: Connection to the Internet is required. Operating system: Mac OS 10.10 and higher. Memory: 4 GB at least; 8 GB and up are recommended. Ghotit offers the most powerful English spelling and grammar checker for people with dyslexia, dysgraphia and other writing difficulties. 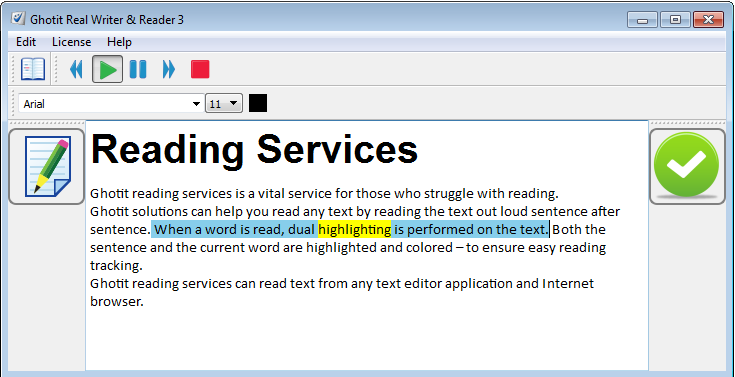 Ghotit Real Writer & Reader is a Windows application that integrates with familiar Windows applications (i.e. Microsoft Office, FireFox, Chrome …). In addition, Ghotit Real Writer & Reader can be used as a stand-alone text editor. Ordinary spell checkers do not take into account the context of the sentence the word is being used. In the world of spell checking, the degree of how badly a word is misspelled is measured by the editing distance of the misspelled word to the intended word. The tradeoff is as follows: the longer the editing distance, the longer the list of candidate words that will be offered. Since ordinary spell checkers cannot properly grade the long list of alternatives, this long list is seen as adding “noise” to the spell checking algorithm. Ordinary spell checkers are tuned for people with mild spelling and typing mistakes, and therefore, prefer to offer a relatively short editing distance in order to minimize the list of candidate words. Here context spell checking algorithms come to play. Once an effective context spell checking is introduced, a larger editing distance can be used since the spell checker can leverage the context of the sentence to optimize the suggested word list and remove the unwanted, out-of-context words. 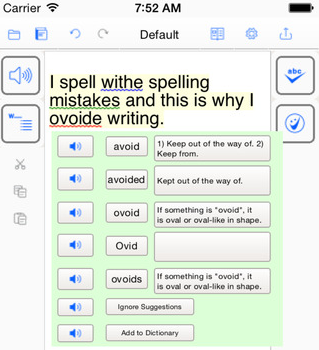 Ghotit has developed an innovative context spell checker which is optimized for people with dyslexia, dysgraphia and other learning disabilities. Ghotit can leverage its context spelling engine to produce an internal long list of candidate words by defining a long editing distance, but then reduce this list and present to the user only the words that make sense in the context of the specific written sentence. High performance techniques were introduced in order to ensure that Ghotit’s context sensitive analysis does not affect user experience and does not introduce spell checking result delays. Ghotit offers a unique context spell checker. Here context spell checking algorithms come to play. Once an effective context spell checking is introduced, a larger editing distance can be used since the spell checker can leverage the context of the sentence to optimize the suggested word list and remove the unwanted, out-of-context words. Ghotit has developed an innovative context spell checker which is optimized for people with dyslexia, dysgraphia and other learning disabilities. Ghotit can leverage its context spelling engine to produce an internal long list of candidate words by defining a long editing distance, but then reduce this list and present to the user only the words that make sense in the context of the specific written sentence. High performance techniques were introduced in order to ensure that Ghotit’s context sensitive analysis does not affect user experience and does not introduce spell checking result delays. Ordinary spell checkers either do not or provide very limited identification of misused words. If a spell checker does not have or has very simplistic context spellchecking algorithms, then it simply can not identify misused words. Without appropriate context knowledge, the spell checker does not have any information to provide for a misused word, and will leave such words as unmarked. In such situations, the writer will not even know that he has errors in his writing. Ghotit context spell checking algorithms have been targeted to effectively identify misused words. A word that is spelled correctly, but has been identified as a misused word according to the words’ sentence, will be marked as such, with a candidate list of words based on the exact context of the word. Ghotit performs grammar and punctuation corrections. The corrections are performed using both grammar rules definitions and contextual spell checking algorithms that analyze the correct grammatical intention of the sentence based on the context of the sentence. Many times users accidentally or not knowingly split words (e.g. “birth day” instead of “birthday”) or merge words (“oneday” instead of “one day”). Ghotit detects these errors and makes the appropriate suggestions. Ghotit is the only spell checker that actually learns from the input the user enters.This patented technology, enables a user to run the Ghotit spell checker, and after the user provides some inputs the user may request to re-run the Ghotit spell checker to receive more optimized results. of the sentence the word is being used. 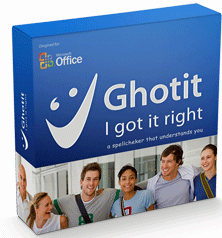 Ghotit is the only spell checker that actually learns from the input the user enters. This patented technology, enables a user to run the Ghotit spell checker, and after the user provides some inputs the user may request to re-run the Ghotit spell checker to receive more optimized results. Ghotit Word prediction is a feature in the Ghotit Real Writer for Microsoft Windows and helps a user in his writing by “predicting” a word the user intended to type. Predictions are based on spelling, context, grammar, syntax, and frequently/recently used words. The word prediction feature assists in the writing of kids and adults who struggle with writing correctly, as it enables them to write correctly with fewer keystrokes. Ghotit’s word prediction provides highly accurate predictions, specifically when the writer is dyslexic or dysgraphic. If you are a really bad speller then you usually have not only problems in writing but also in identifying a correct word from a list of words. Ordinary spell checkers offer you a list of candidate words. But if you are a bad speller, then you do not know for sure which word is the correct one. You need assistance in selecting the correct word. In order to overcome this hurdle, Ghotit has integrated its context spelling services with a dictionary, providing for each suggested word its meaning/s. This additional information provides the effective information for a bad speller to select the correct word from the suggested words list. It’s a well-known fact, Google Docs, is a powerful tool. Unfortunately, people with dyslexia and dysgraphia have problems using it due to their reading and writing limitations. Ghotit Real Writer and Reader acts as a simple-to-use editor which, integrated with Google Docs, solves their productivity problems. 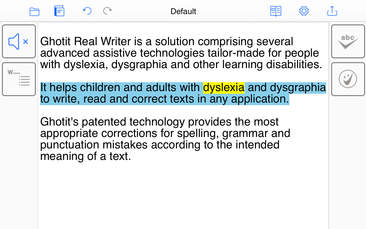 Ghotit’s writing and reading assistive technology including word prediction, context and phonetic spell checking, grammar and punctuation checking, text-to-speech including dual highlighting is tailor-made for their needs. These capabilities are available both online and offline. Ghotit Real Writer&Reader 5 read aloud text from images or non-accessible documents. With Ghotit Real Writer & Reader 6 Floating Toolbar, users enjoy a one click access to Ghotit advanced Reading and Writing tools. Ghotit Real Writer and Ghotit Real Reader is a robust application that supports the needs of a variety of users, all along from primary school kids to graduate students and adults. Ghotit provides this wide –range usefulness by means of effective arsenal of tools. Ghotit interface can easily be personalized offering each user a friendly solution. Contact us for Site and District licenses.